Pre-drawn logical network diagram symbols represent start message, throwing message, start timer, etc. These symbols help create accurate diagrams and documentation. 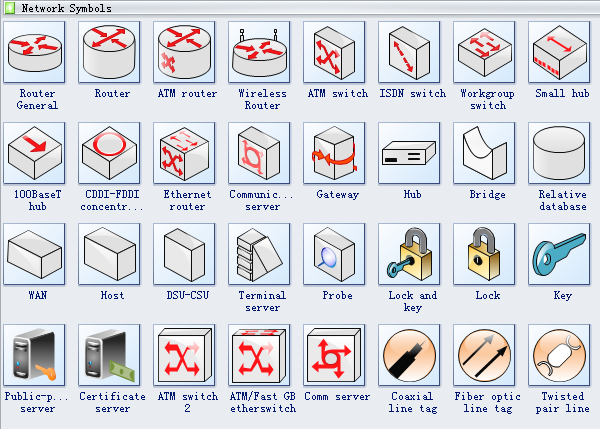 Edraw network software includes many network symbols, router general, router, ATM router, wireless router, ATM switch, ISDN switch, workgroup switch, small hub, 100BaseT hub, CDDI-FDDI concentrator, Ethernet router, WAN, host, DSU-CSU, etc..
WAN short for wide area network, WAN is a collection of computers and network resources connected via a network over a geographic area. Gateway is a device used to connect two different networks, especially a connection to the Internet. iMac is a range of all-in-one Macintosh desktop computers designed and built by Apple Inc.
PDA is a palmtop computer that functions as a personal organizer but also provides email and Internet access. Mini Mac is a small form factor desktop computer manufactured by Apple Inc.
Server is a computer or computer program which manages access to a centralized resource or service in a network. 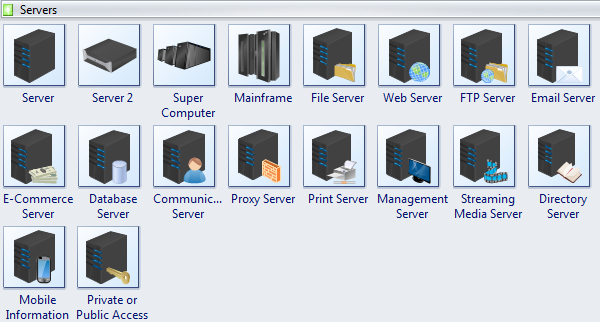 File server is a device which controls access to separately stored files, as part of a multi-user system. Print server is a device that connects printers to client computers over a network. Need fresh looking logical network diagram symbols for your design? These logical network diagram symbols are a cinch to pop in. And their crisp, fine detail will make spectacular, easy-to-understand diagrams and presentations to your customers.